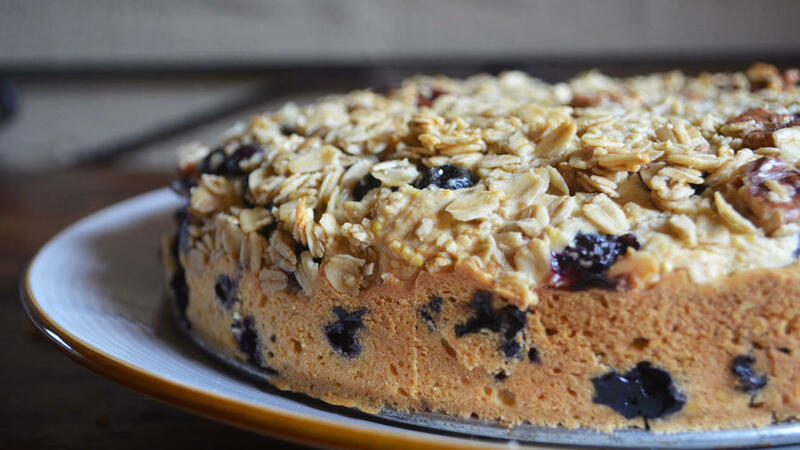 Editorial Assistant Alexandra Deabler channeled her summertime nostalgia into this tasty blueberry cake. Growing up in the Central Valley, summer to me was two things: triple-digit weather and bags of farmers’ market blueberries. Since moving to the Bay Area, the triple digits have stopped, but my love of berries continues. And once I saw this recipe, the nostalgia started rolling in like the fog, and I geared up to bake away those long, overcast San Francisco days. It’s blueberries and it’s cake. It’s summer in a pan. I couldn’t pass that up. What was it like to grow blueberries for your recipe? Full disclosure, I did not actually grow my own blueberries. I went the store-bought route, and after tasting this cake, I would recommend either growing your own berries or making the cake in season and using farmer’s market berries. The recipe calls for no sugar—a half cup of maple syrup and the berries provide the sweetness in this cake, along with the crumble top, which has more maple syrup, and the slightly sweet pecans. The berries really are everything. If you’re using underripe or tart berries, the cake is going to reflect that. I was pretty smitten with the idea of Blueberry Cake, so I didn’t notice at first the long list of ingredients or just how many bowls I would need for prep (three. The answer is three). And I’m glad I didn’t, because I might have been dissuaded from attempting this. It honestly does not get any easier than this cake. Yes, you have a bit of clean-up afterward, but the whole thing comes together in a snap. Mix dry, mix wet, mix together, bake. Pretty simple. As I mentioned earlier, this cake uses no sugar. Which is really cool if you’re on an anti-sugar kick, but it isn’t necessarily the most dessert-like dessert I’ve ever made. I found myself agreeing with Senior Features Editor Chris Ryan when she said, “I thought it was a breakfast thing!” It has a certain tartness that trends more toward morning pastry than after-dinner sweet. Absolutely! I’ll probably make it as more of a brunch dish than a dessert next time. Unless I pair it with the optional whipped cream. “This cake is for those of you who find yourselves with a bumper crop of blueberries—whether you’ve grown your own or bought a gallon bag of pie berries from the farmers’ market. This dense, moist cake puts them front and center. If there’s any left over, it also makes a great breakfast treat the next day,” writes Hardison. Preheat oven to 350 degrees F. Grease and flour a 10-inch round cake pan and set aside. Mix together the flour, cornmeal, baking powder, baking soda, and salt in a large bowl. In a separate bowl, cream 8 tablespoons of the butter and the ½ cup syrup with an electric mixer on medium speed, about 3 minutes. Mix in the eggs, yogurt, and vanilla. Mix the wet ingredients into the dry, one half at a time. Fold the blueberries into the batter with a spatula and pour into the cake pan. In a separate bowl, mix the oats, pecans, the remaining 1 tablespoon of butter, and the remaining 2 tablespoons syrup to make the crumble. Spread it evenly over the top of the cake batter. Bake for 55 minutes or until a knife inserted into the center comes out clean. Serve with whipped cream. Before you start, make sure the cream, the bowl, and whisk are cold. If you have time, put the bowl and the whisk in the freezer for a few minutes beforehand. In a large bowl, start whisking the cream either by hand using large strokes in different directions, or with an electric mixer on medium speed. When soft peaks begin to form, add the vanilla and powdered sugar. Continue whisking until the peaks return and can stand on their own.